Mobile Fidelity Sound Lab SHINE-OLA Optical Disc Cleaner Mobile Fidelity Sound Lab SHINE-OLA Optical Disc Cleaner Improves the Sound of CDs, SACDs, and Other Media: Also Significantly Enhances the Video Quality of Blu-rays and DVDs Mobile Fidelity Sound Lab SHINE-OLA optical disc cleaner is a proprietary polycarbonate cleaner provides a gentle, effective, scratch-free way to clean digital discs. Using SHINE-OLA on audio media such as CDs, SACDs, and DVD-As and video discs like Blu-rays and any DVDs results in significantly better sound and video. Every bottle comes with an ultra-soft micro-fiber cloth for easy and safe cleaning. It also lasts a long time. A 2 oz. 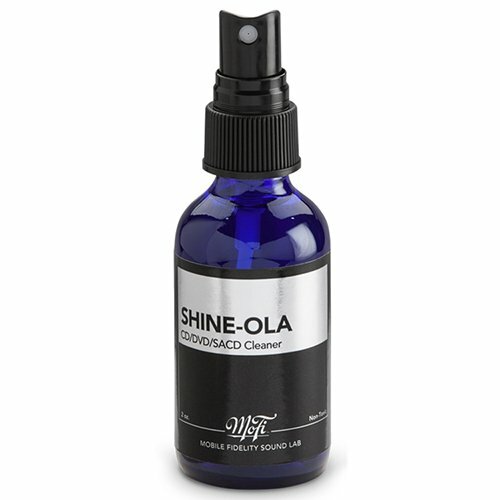 bottle of SHINE-OLA will clean approximately 200 discs, however, if you spray carefully and cover the entire disc with one spray, up to 350 uses is possible. How It Works A proprietary polycarbonate cleaner, SHINE-OLA is incredibly pure, leaves no residue, and does not break down a disc's polymers. It is safe for use on all polycarbonate discs (see list below). SHINE-OLA removes the heat-generated waste molecules left behind by the pressing process, preventing laser-wandering.